​ As the Director of the Department of Environmental Protection's Environmental Education program, I have had the pleasure to work with two interns for the summer of 2018. Erica Gebbia, a student from Bloomsburg University, and Logan Kincaid, from Millersville University, began their internships on May 15. After a month working together, these two individuals are contributing nicely to environmental education efforts at DEP. They hit the ground running, and so far, have spent time developing programming, preparing for workshops, and most vitally, being in the thick of the annual Falcon Watch and Rescue. Possessing a degree of knowledge of the birds of the Commonwealth, they quickly became an asset to keeping track of this year’s crop of falcons during the fledging period. This is by no means an easy task! If you’d like to know more about this year’s nesting adults and their four offspring, visit the PA Falcon Cam website​. One reason our two interns have grown so readily has been their willingness to dive in and contribute to the duties of DEP’s Environmental Education program. With our small staff, their contributions have been significant, and I hope their learning has as well. I recently had the opportunity to observe the fledgling falcons as they took their first flights. To watch a falcon go from controlled falls to graceful arcs from building to building was fascinating. At the beginning of the Falcon Watch and Rescue week, you could tell a juvenile from an adult just from a glance based on how they were flying. As the week progressed, the parents showed off the agility of their flying skills for the juveniles, from aerial food transfers to kiting above the ledge. As the week ended, aerial movements of the juveniles were quickly catching up to the grace of their parents. They still have a way to go, but the juveniles are well on their way to dominating the skies. Observing the family of peregrine falcons has been an incredible opportunity. The Department of Environmental Protection has provided the once endangered species with a safe habitat within the city of Harrisburg on the fifteenth floor of the Rachel Carson State Office Building. Several rescues were performed during this year’s fledging season. Young birds taking their first flights can lead to dangerous and even life-threatening situations. For example, one of the young birds landed on Market Street, a busy section of Harrisburg. If the staff and volunteers were not there to perform a rescue, the young bird could have been in trouble. 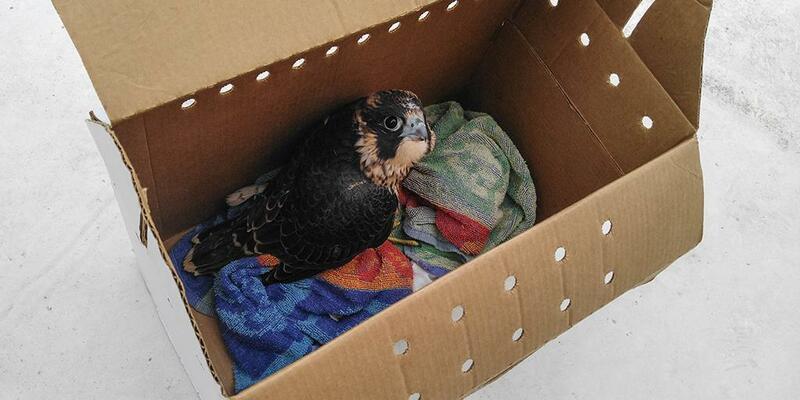 After capturing the young peregrine falcon, it was brought to the roof of the Rachel Carson building. While on the roof to release the young bird, the two adult falcons came charging towards us. It was frightening at first, but I came to the realization that they are protecting their habitat and more importantly their young. Being that close to a fully developed peregrine falcon made me appreciate their strong flying ability. Overall, being able to participate in the Falcon Watch and Rescue was a great opportunity. My hope is that more of the public becomes involved to gain valuable insight and experience.